LP Director General Chit Asis outlines the role of staffers in the LP organizational chart. Understanding the importance of legislative staffers in the advancement of the Liberal Party (LP)’s goals, the National Institute for Policy Studies (NIPS) and the Liberal Caucus of Congressional Staff (LCCS) with the support of the Friedrich Naumann Foundation (FNF) held a Basic Orientation on Liberal Democracy seminar for staff members on September 1, 2005 at Quezon City. It was a back to basics workshop with the aim to familiarize the staff members of the liberal parliamentarians with the ideology of their principals. “Staff work is the key to the success of political work,” LP Director General Concepcion “Chit” Asis said. “Staffers should be masters in handling constituent requests and various political works,” she added. To assist in their challenges ahead, LCCS Chairperson Jonathan Malaya introduced staff members to the role of the caucus. 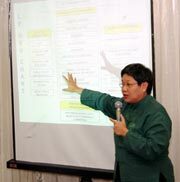 Malaya spoke of the organization as the answer to the need to professionalize their ranks, to foster closer cooperation and to help promote liberal legislation. Saying “we value your opinion and voice,” LP Senior Political Consultant Jose Luis Martin “Chito” Gascon invited the staffers to join the caucus. “LCCS defines the legislative agenda. [It] can play a strategic role in the LP’s goal to move forward from being solid to being united so there is a need to reorganize and expand,” he added. “Through activities like this we hope you will internalize and become passionate about the values of liberalism,” said Minnie Salao, FNF senior administrative officer, in the Foundation’s message of support.